In our office we perform Frenectomies with the LightScalpel CO2 Laser. 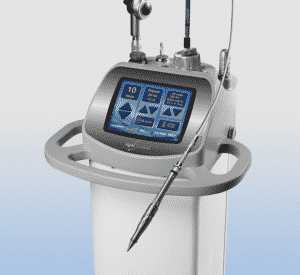 WHAT IS A LIGHTSCALPEL CO2 LASER? The CO2 laser has the unique ability to vaporize or ‘erase’ tissue. The CO2 laser can be used to make incisions, as well as to remove unhealthy tissue. Our laser is so precise that it can selectively remove only a few cells at a time, if needed. WHAT ARE THE ADVANTAGES OF LIGHTSCALPEL CO2 LASER PROCEDURES? Minimized Bleeding: As it vaporizes the tissue, the LightScalpel CO2 laser seals small blood vessels. This great reduction in bleeding makes surgical procedures quick and easy. Less Swelling and Discomfort: The LightScalpel CO2 laser beam seals lymphatics, resulting in less post-operative swelling and discomfort associated with traditional scalpel surgery. Reduced Risk of Infection: The sanitizing effect of the laser reduces the risk of infection and means faster healing. Shortened Surgery Time: Less bleeding results in the improved visibility of the surgical field. Faster recovery: Reduced trauma, minimized bleeding, less pain and swelling, and shorter periods of anesthesia.